Not all intranet software is the same. Your needs and the resources you have as a business will determine the software that is right for you. I’m going to discuss some of the options available in the intranet marketplace and show you how our intranet software fits in. To find out more book a demo with us. In my experience about 80% of intranet requirements between organisations is roughly the same. At a very general level this is to improve communication between staff, store and manage documents or knowledge and to streamline processes (such as booking staff holiday). When you are looking for a new intranet it’s handy to have intranet software that helps you achieve these right away. We do this by providing intranet applications. These applications manage contacts, facilitate discussions, publish and share news as well as a host of other things. It makes it simple and easy to get started. The last 20% is often about improving processes within your organisation. Ironically, this is also where most of the hard ROI and value is to be found. It comes from integrating to existing business systems and creating applications that reflect your processes. Where we differ from other boxed products is that we include the ability to customise and create applications right within our intranet software. It’s easy to use and doesn’t require the same level of technical expertise as you may find in intranet toolkits like SharePoint. 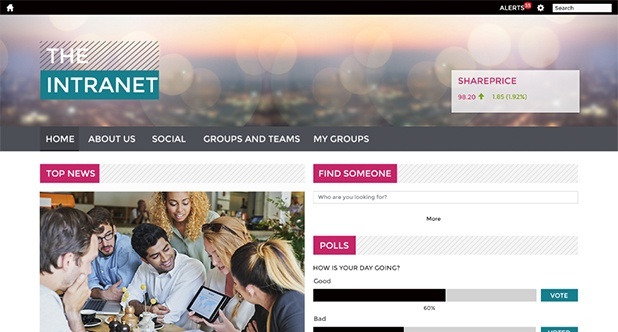 Now if you are looking for an intranet to improve some of your business process you may have considered intranet toolkits like SharePoint. Many organisations look at SharePoint as an intranet as they are familiar with the name or have access to this via other Microsoft products (like Office 365). SharePoint as an intranet is great if you have the time and resources to build and support your intranet requirements, however it will take a long time as most things have to be created from scratch or bolted together. It’s just incredibly hard for anyone non-technical to use which often means that you are reliant on your IT team for everything. SharePoint also gets expensive quickly. You can deliver a really simple intranet for free using the entry version but as soon as you want to match even the most basic features of a boxed solution you need to buy licences (and that’s before you factor in development time). We therefore sit somewhere in the middle. Our intranet software has the flexibility of SharePoint but comes complete with the boxed intranet applications that help you get up and running quickly. This approach enables our intranets to adapt with the needs of your business. A number of our clients have been with us for over 15 years! For an intranet to remain relevant for that length of time it needs to consistently provide staff with the tools to improve their productivity and communicate effectively. If you would like us to show you what our intranet software can deliver, get in touch and we’ll take you through a personalised demo.